Origin and Habitat: Gymnocalycium alboareolatum is known from only one population with an extent of occurrence of less than 100 km2 in La Rioja (area around Villa Bustos), Argentina. The species is locally abundant but there is a continuing decline of mature individuals. Altitude range: 800-1,100 (-1,500?) metres above sea level. Habitat and ecology: The species occurs in monte shrubland. It usually occurs buried in the ground making it very difficult to see when not in flower or fruit. It grows in gravelly slope. The major threat for the species is urban development, the only known populations grows at the edge of a town that is expanding. Parts of the population have been affected by urbanization already and this will not cease in the near future. Hence the species is listed as Critically Endangered. The species is not known to be used or traded. 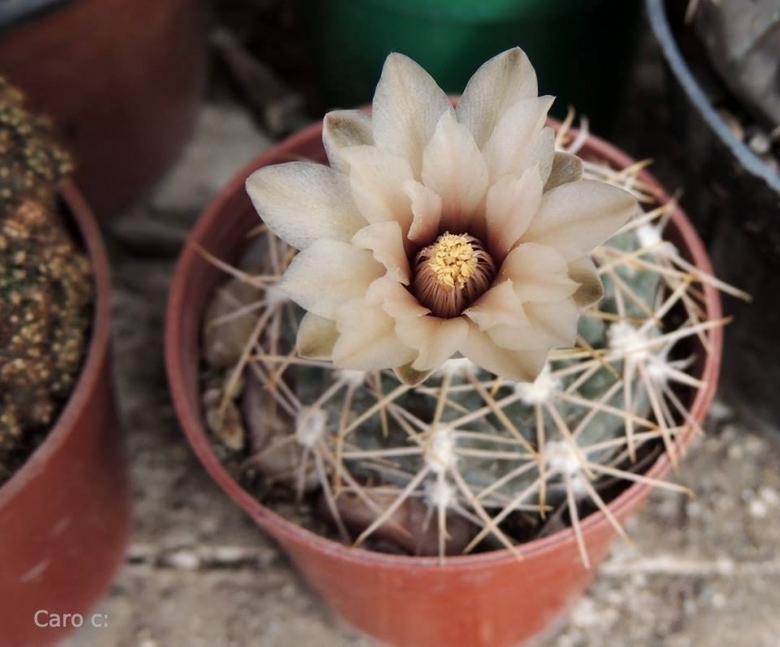 Description: Gymnocalycium albiareolatum is a beautiful species, of modest size, particularly attractive for its beautiful solitary, gray-green, flattened stems less than 6 cm in diameter with very prominent white areoles. The flowers are silvery white often pink flushed usually in clusters from June to September. Note: Gymnocalycium albiareolatum was published by Rausch, in Succulenta 64(10): 213-214, 1985. The name was published with the spelling "alboareolatum”. Since this name is grammatically incorrect, it has been corrected into "albiareolatum" according to Art. 60.8 and Ree. 60G. Derivation of specific name: The species name means 'white areoles' from Latin 'albus', white and Latin 'areola', areole. Stem: Solitary or clumping ( "var ramosum" ), spherical-flattened, to 6(-10) cm in diameter, grey-green, glaucous (brownish in the dry season), barely rising above ground level with a swollen underground root system. Ribs: (8-)9-11(-13), straight with well-defined chinlike protrusions to up to 1 cm in height below the areoles. Areoles: Quite large, initially with a thick, white wool, round to oval, up to 5 mm thick. Radial spines: 6-7, bent, curving back toward the body, hard, brown, 1 cm in length. Flowers: Funnel-shaped, slender, silver-white on the outside, pink inside (with reddish throat), outer perianth segments with a green stripe to 6.5 cm long and 4.5 cm in diameter (rarely to 6cm). Fruits: Oval, to club shaped, blue-green, glaucous, 25-35 mm long and up to 1 cm in diameter. Seeds: Dull black, hat-shaped and about 1mm in diameter. Rlated species: Gymnocalycium hossei is probably the closest relative of Gymnocalycium albiareolatum. A quite similar-looking form of Gymnocalycium kieslingii (Gymnocalycium kieslingii f. albiareolatum) growing in the same area (though usually at about 1500 m altitude) has been often indicated as a synonym of Gymnocalycium albiareolatum, but has different seeds and belongs to another group. Gymnocalycium albiareolatum Rausch: has small solitary body up to 6 cm. Distribution: La Rioja, (Villa Bustos area), Argentina. Gymnocalycium alboareolatum var. ramosum Rausch: has small body up to 5 cm often clumping. Distribution: La Rioja, (Sanogasto area), Argentina. 5) Demaio, P., Trevisson, M. & Perea, M. 2013. Gymnocalycium albiareolatum. The IUCN Red List of Threatened Species 2013: e.T152872A688953. http://dx.doi.org/10.2305/IUCN.UK.2013-1.RLTS.T152872A688953.en. Downloaded on 07 February 2016. Cultivation and Propagation: Gymnocalycium albiareolatum is a summer grower species that is easy to cultivate. Growth rate: It is a relatively slowly growing but easily flowering species. Hardiness: Reputedly resistant to frost if kept on the dry side prior to, and during, cold weather (hardy to -5 C° C, or less for short periods).